This Curzon Cologne by Geo. 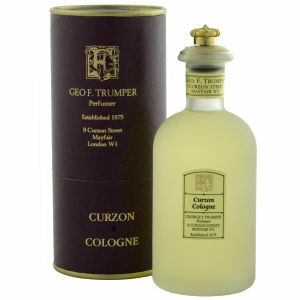 F. Trumper boasts an ingenious blend of spice and cyphre, bringing you the best of both worlds when it comes to scent. This rich and spicy scent will give your skin a vibrant aroma, and awaken the senses with every use. This Trumpers Curzon Cologne mixes the rich and dark overtones of spice with the light notes of cyphre in order to give you a bewitching fragrances designed to bewitch and ensnare the senses. Treat yourself to the scents of crisp and invigorating Curzon with every spritz.